I left you at this version of the farmhouse bedroom. It was in transition to a decidedly French bedroom. I know, I know the wall doesn’t look quite right, but I love, love the mirror here. So I knew that I had to add something if I wanted to keep the mirror here. I thought it was too narrow and tall to look right. I felt it needed to be wider to work with the bed. So I added some vintage ironstone platters and plates. Now I know someone isn’t going to like it, but I do. And I do what works for me, even if someone doesn’t like it. And even if someone is telling you that your room is ‘wrong’, I think that it’s your room, and you need to do what suits you. The other thing I did, was to make a linen bed skirt because I couldn’t find one the correct length, 21 inches to be exact. I did not iron it after I washed it. I love that wrinkled linen look!! Here is a close up of the vintage ironstone platters. The mirror is actually new, but was made to look old. I wasn’t ‘me’. I like to have a different look in each room, but I keep coming back to neutrals, soft French details, and linen ruffles. I know some people on my Facebook page really did not like the large mirror behind my bed, but it is staying at least for now. I do listen to every piece of decorating advice I am given, and truly, I am given A LOT! Some I incorporate, and some I don’t, but I appreciate ALL of it. What’s next in here? Some soft curtains at some point, but that’s on the back burner for now. I’m still enjoying the new mirror! Absolutely beautiful, love the touch of turquoise! LOVE! I seriously want the bed skirt – gorgeous. I love it! The colors are so soothing in there and the plates add more width to match the bed. I always enjoy watching the changes you make to a room. Beautiful! Love the skirt, love the mirror, and love Anita, that it’s your home & it needs to feel right for YOU! Beautiful and relaxing! I love the colors and all your choices in furniture and accessories! The room has a very relaxing and warm feel. It’s like a hug at the end of the day and isn’t that what a bedroom should feel like after all 🙂 Wishing you many sweet dreams in your new bedroom! Looks great with the vertical mirror and ironstone. The bed skirt does give the soft and feminine effect. My preference would be to have less on the night stand. Too many unrelated objects. I think (?) a favorite picture, small French clock, flowers and a book is what I would choose. You have great ideas and I always enjoy what I view on your site. 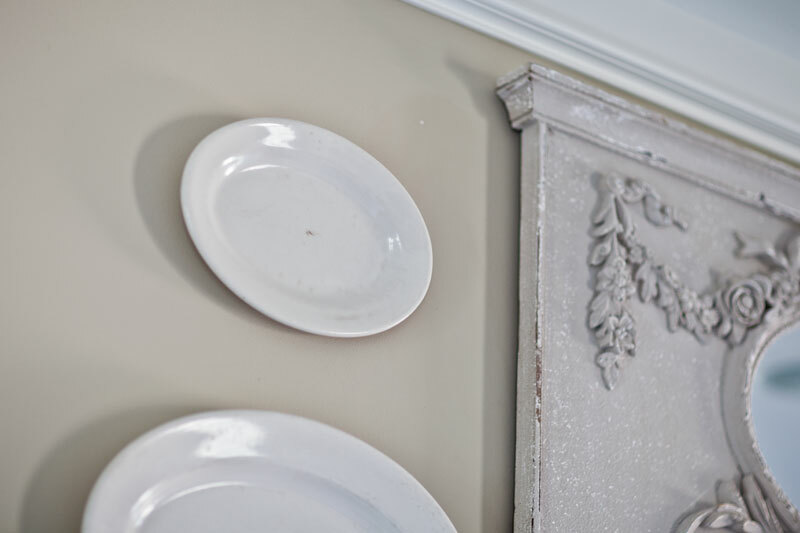 If you like ironstone serving pieces hung in the bedroom I agree with you – just go for it! I work part-time in a home decor store with five other part-time woman. I assure you there are at least six different views on how to decorate anything and everything. Your bed linens are fantastic. So inviting makes me want to dive in! It’s gorgeous! I love everything about it. Do not listen to naysayers…the big mirror is awesome!! Happy sleeping!!! I think what I like so much about you ,besides your incredible decorating skill, is that although I don’t have your resources I can still put your design ideas and suggestions into practice on my own way more modest scale. Thank you. I like it! Plates are a great way to “embellish” a single piece that just needs a little something more. I also like the paint color. Can you tell me the brand and color? Thanks! Right side wall I mean. LoL, i’m a lefty so everything is left to me! Oh Amy, I might. That’s always an option, but I did have two things on this wall, and ended up liking just the one thing for now. Good thought! I love your advice about if you like it and it works for you then keep it. Isn’t that what decorating your home is all about……what you like and it works for you. Thank you! Thank you!! I added some flowers for the photo, so the table is normally more sparse so I can set my things down there. Yes I am moving to less things being out also. i think I would love to get into the bed and the room is so pleasant, who needs fussy things, i like to feel calm and serene. can you tell me how you got the bed skirt to stay on a frame like this? It is made like any other bed skirt, so it sits on top of the foundation. It sits on the foundation like any other bed skirt. I love what you have done, it looks just right not too much not too little. You are the one who has to see it every day,no one else does so Anita ,make it yours. Whatever works for you is what you should do. No one’s opinion is more important than yours, and that includes mine. As someone said in an earlier comment, if you have 6 women, you’ll get 6 different ways of decorating – and that’s a good thing. how boring would it be if everyone liked the exact same thing?? The best piece of decorating advice I was ever given. . . I think the mirror would look fabulous anywhere in your home!!! Exactly where YOU choose to put it!!! The bed skirt adds such a softness in your Master Bedroom!!! I know exactly what you mean abut the mirror. I found one I truly loved, not antique or vintage, but would help me get to the French look I so desired and I bought it and hung it above the fireplace…with lots of help from hubby and his friend. I have windows on either side and now I am looking for big plates/platters to hang over the windows for balance. I love your look right now! The room looks gorgeous and I do prefer the longer bed skirt, I think the this room suits the softer look. As for the plates either side, they definitely balance out this space. I wonder what they would look like with just three plates either side, maybe a wide at the top and bottom and a smaller central one, without two small side by side ones. I am sure you tried out many different combinations already. I like the way the oval plate reflects the shape of the smaller mirror at the top and like you say, in the end it is what works for you. I love this room and although it has a distinctly French feel it has lots of interesting textures incorporated such as the metal basket, the soft throws and rattan and wood. It is a combination of textures that makes a room work. I still have things to change and add to my new bedroom. It surely is your room, to do as you wish. No argument, there, but ’twere mine, I’d be banging into a plate or the mirror every time i wanted to read in bed. So I’m guessing this is not a problem for you. Ahhh, well decorating needs to be functional and lovely so that is a great point MJ. The bed is actually several inches from the wall, so I have never hit the wall while sitting in bed. There is a headboard to keep you from hitting the wall. If someone did not have a headboard, this would probably not be practical. I love the changes! I think the ironstone plates on each side of the mirror make that whole wall look fabulous. Way better than the tiny mirror that was originally there. I’m not usually a lover of tan walls but I love this particular tan combined with the white and the blues you chose for the room. This is a bedroom that makes a person feel relaxed. Very calm and beautiful. I totally agree with you. You should always choose what makes you happy, not what other people say you should choose. You are the one that has to live in it and feel comfortable in it. Although it always feels good to know that other people agree with your taste, so just to let you know, I LOVE, LOVE, LOVE this bedroom. I’m also in love with your white farmhouse kitchen. I love your room, it is practically what I had in mind for our new house and new bedroom. I notice you have blinds and state at the end of the blog “curtains on the back burner”, I was thinking in my new room I would like soft floating curtains. I have thought of very fine linen, what do you think. There are going to be floor to ceiling glass sliding doors on two walls. As I live on the far north coast in New South Wales, Australia, our temps are in the high teens low 20’s for fall and winter and much higher in spring/summer. Your bedroom looks so pretty and inviting! 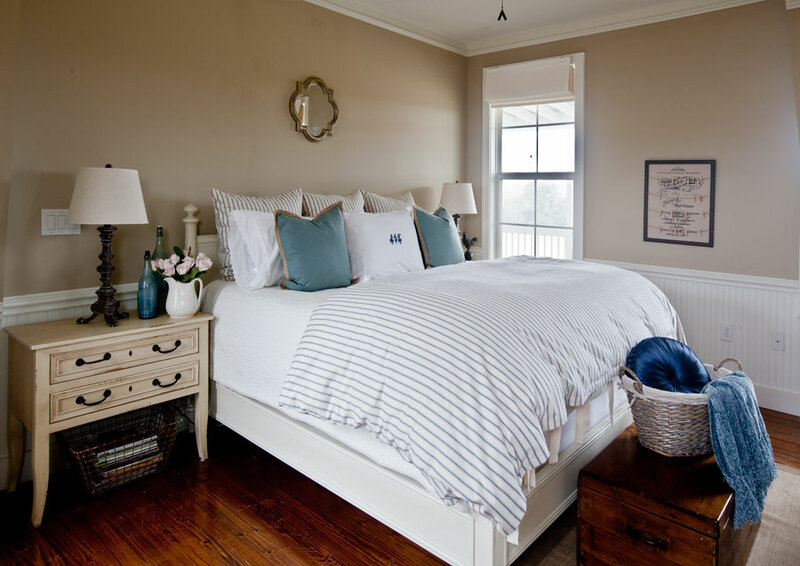 I love the pops of blue and the grouping of items above the bed. Anita,Your bedroom is beautiful.The curtains sound like they would add softness to the room. I love your room. May I ask where you got your duvet cover? What a welcoming room. I like the wrinkled bed skirt. It has that country feel. I also have plates in my guest room and think they look perfect. Anita, enjoy all the time that you can with your daughter. They get busy with their own lives, sometimes move away for jobs, and we see them very little. But, you will have made that connection that will last forever. Love the look. I have bedskirts on all my beds. The mirror & ironstone speak to me also. I love all china! I collect a lot of it & have inherited a lot from parents & in-laws. Some matches & some doesn’t. I had received enough to share with our daughter & son. I know our home is not a sleak or in fashion, but I love it & so does my husband & family & this is all that matters. Love the mirror, plates, and linen dust ruffle! I would have to iron the dust ruffle! Love the look of hanging plates!! How do you hang yours? I will share this technique later. Your bedroom looks great! I love the mirror, can you tell me where you found it? 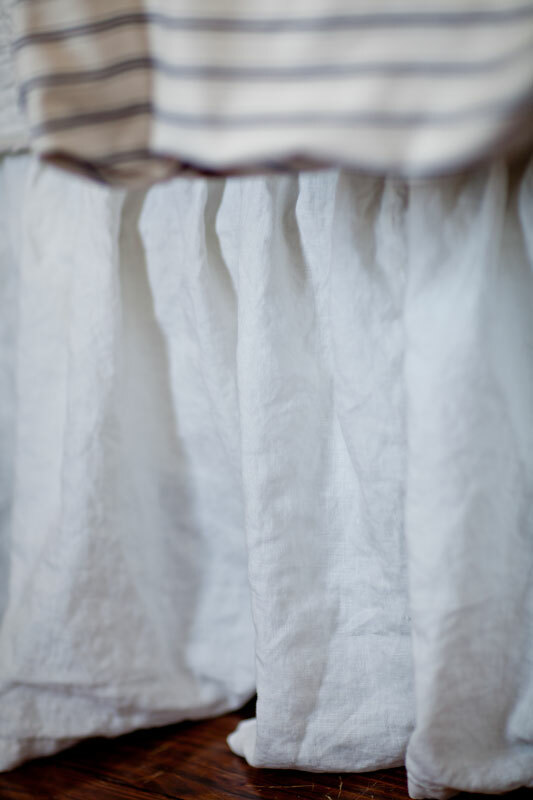 Also the linen bed skirt is perfection…you are so talented…enjoy your room! Jubilee in the Houston Heights. I like the way the platters fill out your wall space. Their shapes are a perfect compliment to the mirror and it’s a great way to save money. I like what you said about liking your own choices and that is important. It is how we find our true self and not the world’s rendition. The room looks great. I love the bedding….it looks so fresh and summery. The plates are the cherry on the sundae. 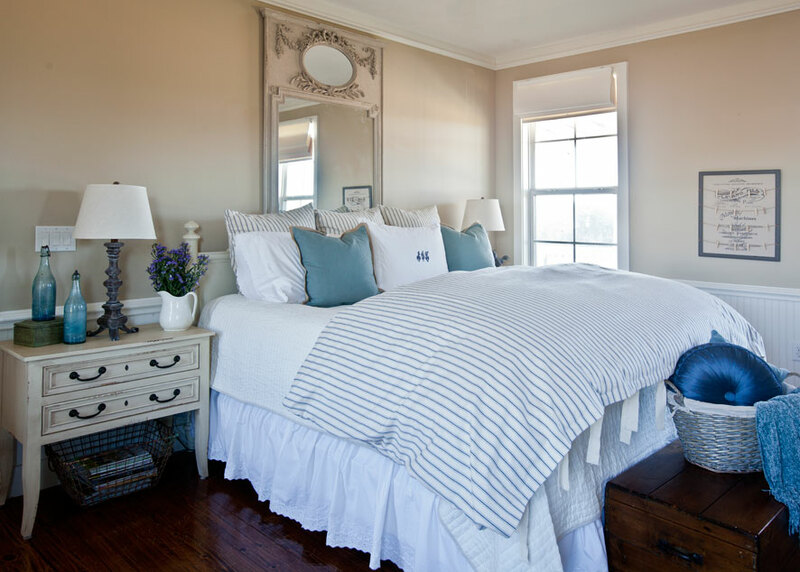 The whole room works together and the mirror looks right at home over the bed flanked by the plates. The pops of blue are perfect. Your room is very pretty. HI I love it you have me thinking now about my own bedroom, I like your bed with the skirt but its also nice to know it looks great with out it to for when you want a change. The bigger mirror suits the big bed LOvE the wall very french I think! Anita, I love the look in your bedroom. The mirror is a great find and really like the plates surrounding it. This room is coming together nicely. I love the mirror and the bed skirt….I’m not a fan of dishes in the bedroom….I would do a triptic… Add two rectangular mirrored or fabric covered panels framed like the lower square mirror with something like Ralph Lauren Beaumont Blockprint-Ink as the panel fabric. I’d use some of the same fabric as pillows or other fabric accents in the room. I love it! Your hunch is usually your best bet, go with it! 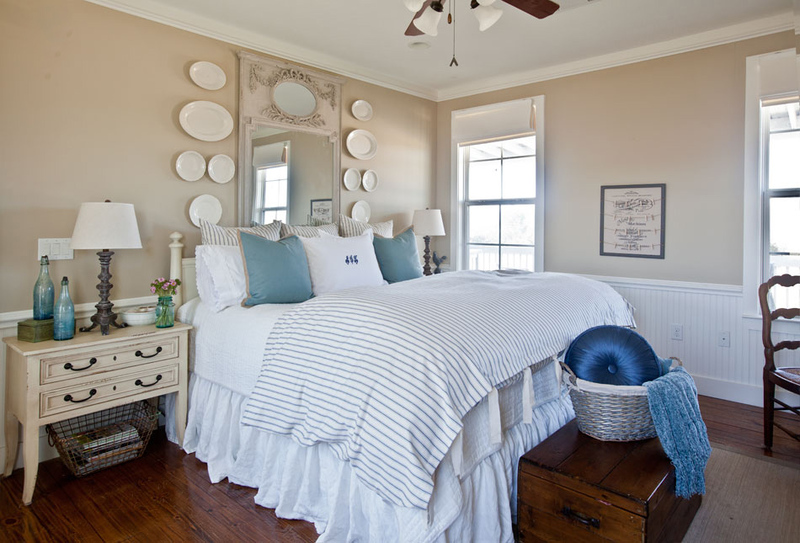 The whole bedroom is beautiful & I love the plates with the mirror!